First-time feature film director Evan Cecil is bringing his blood-thirsty horror Lasso to Arrow Video FrightFest 2018 for its UK Premiere. With a cast featuring The 100’s Lindsey Morgan and Little House on the Prairie’s Karen Grassle, the inventive film harks back to classic horror and features some truly spectacular death scenes. I’ll admit I watched some of them with my hands over my eyes! Ahead of the film’s arrival in the UK I spoke with director Evan Cecil to find out more about it, discuss the realistic practical effects, and to talk about the challenges of bringing the film to life. Hi Evan. How are you doing today and where are you speaking to me from? Hiya, doing great! Just sitting at home, excited for these questions! Your new film Lasso is going to be screening at Arrow Video FrightFest this month. Tell us what it’s all about. In a nutshell, Lasso is a horror film set at a rodeo. I put a lot of work into making something unique that hasn’t been seen before. Just starting there, the Rodeo horror setting is not something I have been able to find being done before. Its got a live-through-the-night 80’s cult horror film vibe somewhat. I am really proud of it, it was a huge undertaking to pull off, tons of kills, stunts, animals, action, etc. You and Roberto Marinas, who wrote the screenplay, came up with the story. Where did your inspiration come from? Well, it sounds so expected, but I went to a small rodeo in the Redwoods of Northern California, and it had such a spooky vibe there was no denying for me what a great setting a rodeo would be for a horror film. As far as the inspiration for the story, that came from all over the place, quite a bit actually from my life. The main example being, the relationship between Simon and Ennis in the film in somewhat based on a friendship from my life. There are a lot of practical special effects throughout Lasso, which make the death scenes look very realistic. How tricky is it to capture those on camera? That is awesome to hear! Some of the practical effects were a piece of cake, we could easily plop down a camera anywhere, from any angle, and it looked great. While others had very limited shoot-able angles, if the camera moved an inch, the effect would be blown! Ha, maybe not that bad, but felt like it. Of course, how you light the effects is huge as well, luckily the DP Luke Sauer was No Joke! Everything, as you said looks very realistic. The film features a fantastic cast. How did you get such a great cast of actors together and convince Karen Grassle to get involved? Thank you, yes, I was extremely happy with all the cast. Luckily for me, our Casting Director, Nina Henninger, did a fantastic job. I have known her for a long time, so we already had a great track record of collaborating/brain storming together. It was also super tricky because we didn’t have the resources in our budget and schedule to do any rehearsals or even cast-chemistry readings, so we didn’t really know how it would all work until we were out in the field. As far as Karen goes, she was so fun to have. Nina has worked with Karen in the past and was able to get her excited about the project. Honestly, I don’t think Karen was looking for a horror project to get involved with, but she fell for the project once she read the script and really jived with her character Lillian’s story. Lasso is your feature film debut as a director. You’ve previously done a lot of directing for TV. What would you say are the biggest differences between directing for film as opposed to TV? It’s funny because in some ways it is entirely the same and, in some ways, it feels extremely different. The TV stuff in general as been a bit more run n’ gun, extremely impacted schedule and budget, and just figuring out how to make it work. The then a film has more prep and planning but still out on the set I am flexing those same “make it work” muscles. I feel really lucky for the intensive Directing boot-camp I got from the TV work, we shot once for fifteen months straight, four different full seasons of two different series, it was nuts, but I learned so much and was able apply a ton to Lasso. What was the most challenging part of making Lasso and why? The schedule! It was gruelling, so many nights! I was exhausted the whole time. We had a last-minute schedule push which had a huge impact on all of filming. We were approaching Spring, so this schedule pushed us right into shorter nights, so we had less time daily to finish our work each night before the sun came up. Also, the schedule push had a ripple effect that caused us to schedule the largest amount of shooting content to our 1st and 2nd shooting days. It was brutal! But we managed to get it done, mostly thanks to the amazing crew! If there was one horror movie you could have directed, what would it be and why? What a great question! Well is it terrible to say Jaws, because of what it did for the career of the director? It’s a great movie too, of course. I have a few things I am working on right now. One I am not quite ready to talk about fully, one called Bunker, which is a thriller around a military mission that goes bad. The surviving solders meet at the bunker rally point. As they figure out their next move to get the safety, they also slowly realise their mission was sabotaged and by someone in the group. Its very intense and suspenseful. The other one is another horror film called Precipice, it a very dark and edgy, but at the same time the deepest of love stories, I am in love with that contrast in the story. Why should people buy a ticket to see Lasso at Arrow Video FrightFest? Because I guarantee that you will have a blast watching it. It really is a special horror movie, I am not just saying it! And horror movies in my opinion are so much more fun to watch on a big screen with a big crowd! 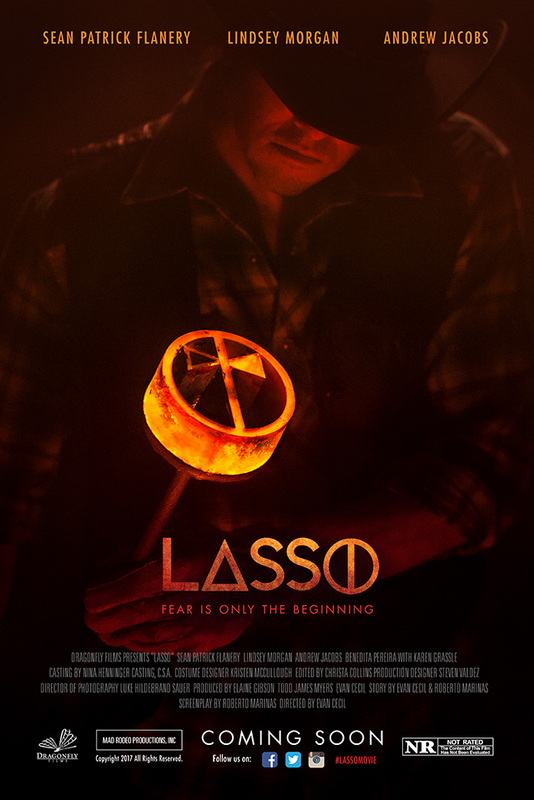 LASSO – FRIGHTFEST EXCLUSIVE from FrightFest on Vimeo. Arrow Video FrightFest 2018 takes place from 23rd to 27th August 2018 in London. For more details and tickets, head over to www.frightfest.co.uk.